We completed this basement renovation five years ago and recently came back to remodel the kitchen (see the kitchen project here for more pictures). Our clients, who had one child at the time (now there are three), wanted a space that combined a family hang out, a reading nook, and a playhouse for the kids while carving out some space for storage. The fun part is evident in the photos: A two-story playhouse with slide across the way. The storage though, is everywhere - you just might not notice it. Behind the barn door, alongside utilities, is shelving for large items. 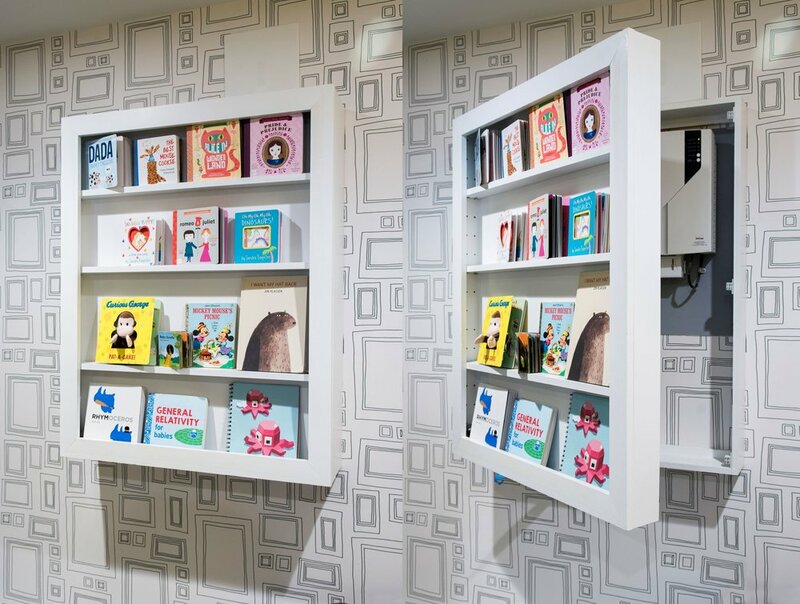 The electrical panel is hidden behind a moveable kid book shelf. The risers on the stairs to the playhouse open up and are drawers for toys. There are built-in bookshelves in the reading nook. But the biggest surprise is the tall bookcase that opens to reveal under-stair storage (and another place for the kids to hide).